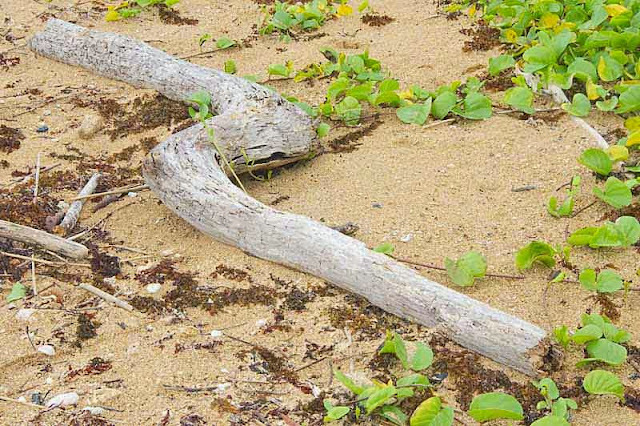 The mission was to hunt for some driftwood needed for an Okinawan Folktale. It took me about two hours before, I realized, there was nobody out there but me. With a typhoon passing recently, there was plenty of debris washed ashore. I guess, any piece of wood, could qualify as driftwood. Several samples were photographed but, it may take awhile longer to select the right image. As long as, I was carrying a tripod, I figured a few animations could be composed. There is something about the action of waves on the beach that's relaxing. There was hardly any breeze and the only sound was water hitting the shoreline. After walking for three hours, I rounded the bend in the far left of this photo. A young couple had discovered a road, leading to my secluded beach. But, when they saw me coming with the camera, they drove off. Hah ! The next time, I visit one of the stores in the big city, I might buy a hammock. If, one were to be stashed in those woods, I could spend a whole day at this beach ! My wife and I were discussing our upcoming visit and talked of walks on empty beaches like this one in your story. Enjoyed the Gifs. Kim, Glad to hear, you enjoyed the scenery. And, I hope we get to meet during your visit to the island.